PLANT SEEDS OF KINDNESS EVERYWHERE YOU GO!!! I finally made the dishwasher detergent my daughter gave me the recipe over two years ago, kind of embarrassing to admit that I could have been saving a lot of money, but .... now I am I think it cost about 60 cents to make, compared to a $3 bottle of store bought stuff, and a friend gave ma a fabulous all purpose cleaner recipe that wipes the dirt off the shower including the glass doors. I went on a cleaning spree.. not sure how much I saved but its a savings. Danyel, wow, what a windfall you go with all those free apples and pears!! Fantastic!! I think I "see" some yummy Apple Pies in your future. With the pie filling ready to go, all the work is done except the crust and you can always buy it ready made in a pinch. Mmmm, I love apple pie hot, or cold for breakfast. Or lunch. Or snack. LOL! I saved money by holding companies accountable for the products they sell. I had a zip-loc food sealer that had tiny plastic tabs that have to lock for it to work. One broke off and I was grumbling about just having to throw the whole thing away. I hate the disposable mentality, so I wrote the manufacturer a nice letter, how I found their product so useful but wish they would spend a few more cents to make it more durable. I got an almost immediate response. They checked the date and found it was under warrantee. They arranged for it to be picked up by Fed Ex and returned for repair or replacement. A few days later I got a brand new one! So that encouraged me to complained to Anchor-Hocking company because the painted on measurements on my measuring cup had faded enough to be unusable. I was informed they would send a new one within 2 weeks. Polite complaining worked! I have done that also. One year in the winter, I slipped on an icy sidewalk that the city was supposed to take care of and fell on my bag. Inside was my glucose monitor and I noticed that the numbers were not showing up on the screen properly. I called the city and told them what had happened and told them how much the machine costs. They sent me a check for the amount and de-iced the sidewalk. About a week later, I got a notice from the manufacturer of the machine that it had been recalled due to a problem with the display screen. They sent me a new one and provided me with a package in which to send the old one back. Quite a score! Danyel, what a blessing to have a dehydrator. You will love it especially with those apples and pears coming. I love when others bless each other with fruit or veggies too. The apples and pears will be great! 56 pints of tomatoes? You go girl! I wish that mine would ripen, it has been on the cooler side here. Judy, you are always super busy! Gosh, I can't believe how much you pay for diesel, and here I am complaining about our prices. Sorry. How funny that Izzy is eating your peas. Last evening I was picking Yellow Wax Beans and our dog Charlie started pulling them from my basket. When I told him 'no' he started pulling them from the plant and eating them :) I have a question regarding Peas :) I planted some English (shelling) peas this year enough for 3 Teepees. I have no idea how much they will harvest but so far I do know that I would love to have an abundance from next years garden. Do you know how much I should plant to yield 20 pounds or more? We groom our dogs too. The vets here charge $12.00 for a pedicure, that is my honey's job I am afraid that I will hurt them. Cindy, I love shopping in the ethnic aisles. You can always find such neat items and great prices! And it does pay to keep on top of your accounts. In fact we need to make a call today because and automatic payment which is supposed to be monthly came out of our account for the annual fee. Winnie, I think I will need to try listing some items on e-bay. Good for you! Sara, I love checking out the discontinued rack! I have found many top quality and gourmet products at half price. Good for you on saving money with your tree man. Some laborers charge way too much. Judy (wildflower17), Isn't that So like the Lord! I cannot tell you how many times we have needed or wanted items and sure enough someone comes along and blesses us. Susan, yes! I do let companies know when their product is defective or bad. I also let them know when I am very pleased too! Marie, sorry to hear about your fall. That's great that the city took care of your monitor for you. ~Canned peaches for the first time. I have not been a great fan of canned fruit but wow, these taste good! ~Peach scraps went to the pigs and they loved them! Pits went to compost. ~Ordered some Maple Syrup. One gallon for $50.00 and $12.00 for shipping. This is a great deal and the syrup we get is superb! ~Getting ready to freeze some Kale from the garden. This is our first year growing it and it is doing great. It will be wonderful in soups and quiches this winter. ~I needed a picture frame (certain size) and went to the thrift store. I found just what I was looking for $1.00. ~My mom lives with us and buys half & half. We get raw milk and have been trying to get her to use it not only for drinking, so for the past 2 weeks I have been mixing half the cream with the milk so she can use that in her coffee instead. ~I have been harvesting Sage. We have one plant and it will usually bring us a couple of harvest. I have plenty for cooking so I have been rubberbanding bunches and hanging them from a long 'rope' I braided from jute. These not only look nice but will be a fire starter when dry. That is all that I can think of right now. Boy time is really flying by here! Can't believe that August is just about over. Everyone always inspires with me with what they do! Sharon, not quite sure what old English peas are????? We looked them up but could only bring up a sweet pea (flower) variety at first. Which I'm pretty sure that's not what you're meaning. When we did find a variety they looked very much like Homesteader shelling peas. If that's what you need to know about we can help. We've planted them for years & love the HEAVY crops. The pods fill out great. The peas freeze very well! Remember discussing planting peas for your pigs.....homesteader peas are what we plant for them & they wallow in them with happy faces! LOL Since you mentioned teepees probably homesteaders aren't what you mean since they're more a bush type. Hubby wants to know if you mean 20# strictly shelled to eat or to dry & then he'll look for info. Try phoning Baker's Creek! They're outstanding to answer any questions on old varieties. after doing winter chores it's enough of outside. I'm one happy camper!! -Canning & freeing the garden....cabbage rolls today....the local butcher closed his doors so bought a lot of hamburger, used the left overs to make meatballs. -Thrift store had a 50% off clothing....bag of work clothes & found 3 good white blouses. The peas we are growing are a vine and are a shelling pea to eat. I would just love to be able to freeze an abundance for the winter months. I will check into the Homesteader peas for the pigs. We just planted some Barley for them and it is sprouting already. Have you heard of Mangalitsa pigs? They are the 'wooly' pigs. Someone contacted us about our Large Blacks and wants our boar to service his Mangalitsa sow. They sure look different, his are the swallow-bellied. I saved $22 plus change at the grocery store. 2 pkg. marked-down Jenny-0 Turkey Italian Sausage $2.25 ea. Other money saved on advertised sales. Saved a bundle by staying off of QVC web site. I love all of the Farmgirl ingenuity here on how to save money in a variety of ways! There are always suggestions that never even occur to me. I don't have anything earth shattering to add here today except that I try and always stay simple and consistent in what I purchase in groceries. My fridge is literally empty each week by the time I go to the store. When I shop, I make sure I always have the basics for making a variety of meals (onions, celery, carrots, beans, chicken broth, rice, pasta,butter etc.). Then each week, I make out a list of meals and figure out what I need to add to the basics. I make a list and only buy what is on that list. If there are in-store specials on basics items , then I will buy two and freeze the other or stock the pantry. Even though there are only two at home now, the cost of groceries has risen quite a bit in the past few years. All of these ideas here that we share are great ways to learn new ideas for stretching our dollars! That's way I love reading these post I learn something every time! I know the older breed of pigs are fat pigs (well, that what we call ours) so you wonder what the ratio is to that breed?? Where did the guy get them from? Are they on a endangered list? HOw wonderful to see them. Thanks for sharing! Do you butcher your own pigs? Ever tried sausages or patties before? We grind up one just for that reason then the other is cut into the normal cuts. We like regulating the content of the sausages. Plus we get pretty creative with the spices/herbs, even tossed in some dried apricots & it turn out to be the fav for everyone. Eh, about the peas....hubby says there's cheaper pea seeds out there depending on how much you want to plant??? Sharon, was it you that had the water sprinkler on the pigs......LOVED it!! I'm sure you're BUSY today as always! Look forward to your posts to learn more & try things out. Sara, $22 is better in your pocket than a store's!!!!! If due dates are still good why not??? One of my family just about goes nuts if she see me shopping off the discount racks. How crazy!! Good for you!! Baked in a little tomato sauce then stuffed in a sub bun & cheese on top. Salad rounds out the meal. -drying more herbs today....it sure makes the basement smell fresh! giggle.....had a pint day I guess! Peaches are glaring at me but tomorrow will do. Have done the bottled ones so want the pie filling, jam, dried & chutney. Can anyone tell me what pickle crisp is please? We don't have it here & never heard of it. This book calls for it when pickling zucchini. From the name I know why it's used but that's it. Trying to find something else to use??? It's been hubby's day ALLLLLLL the way! He had to look deep but found 5 cobs of corn. He's one happy camper! He loves corn!!!! Can't believe that is changing already. OH, just a hint.....keep a few cobs on the stalks to REALLY turn golden, WAY passed the eating stage then harvest & DRY VERY WELL. Rub off the cobs & in a cast iron pan with in a wee bit of oil & toss in some kennels & they will swell (shake it every so often) & are sooooooooo good! Season while hot! Every fall packages of it go over seas to our girls. Baling the last field of hay this afternoon!!!!! Now that's a happy dance!!!! Judy, so proud for you. That's quite a savings. Yesterday, after I had posted what I saved at the grocery store my sister called me from the same store. 8 oz. large sliced portabella mushrooms pkg. marked down for 99 cents - also 8 oz. whole baby bellas. She got be 6 pkg. of the sliced & 2 of the babies. The mushrooms were still very good only the date was up. Yesterday I prepared the sliced ones - today I will be drying them in de-hydrator. The babies will be used in cooking. The large sliced ones are $3.50 a pkg. The babies were $2.50 so I saved a total of $17.92. Later in September I have to take my kitty to the vet for her rabies booster shot and that means I need a safe way to transport her. BUT I don't want to spend big bucks on a pet carrier that won't be used very often. Found a used one at a thrift store for $2.50! I'll clean it and we'll be good to go for these infrequent trips! CeeJay, I found my kitty carrier on the side of the road in perfect condition. All I needed was to clean it up and it has been great for 7 years. I was delighted to find such a bargain!! Saved $44 at grocery store today with buy 1 get 1 for a penny sale. Good way to stock up on paper goods and staples. Got 7 lg. green bell peppers for $2 on markdown table. The peppers were perfect - don't know why they were marked down. 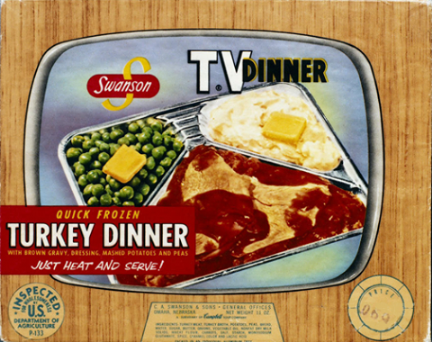 Today is the 60th Anniversary of the TV Dinner! My granny use to save the aluminum trays and then we would make TV dinners out of leftovers, especially at Thanksgiving and Christmas and freeze them for future dinners. It was great in February to have turkey and dressing!! Since we did not eat them often, our next door neighbor saved us her trays, she was a single working mom, so my Granny would send over leftovers to her sometimes. I still do this but just store them in Tupperware. Connie, in my late teens & early 20's I ate a lot of Swanson TV dinners too on those wobbly metal TV trays. Come to think of it Swanson was the only brand back then. We don't eat out often, but when we do we pretty much do NOT order beverages with our meal and just go with water. Even a cup of coffee or glass of iced tea, these days, can be pretty pricey. And, I like GOOD coffee . . . many restaurants serve coffee that just doesn't taste good, or so old and strong you could remove paint with it! Hi gals, I love y'all's creativity and ingenuity. Today, I saved 70% on fruit trees. The local nursery is getting rid of the leftovers from the Spring and getting ready for the new fruit tree sales. For example, $40 Satsuma for $12....got 4. $60 Persimmon for $18...got 2. We're coming up on planting/transplanting season in late Sept and Oct. I always try to buy the leftover trees from the spring to save money. They're usually root bound in the containers and in need of a lot of TLC. BUT! I have good success in reviving them. I build up my orchard like this every year. Woo Hoo! One of the best compliments from one of my daughters: "Moma, you smell good...like dirt." Michael and I went and visited the owner of the Mangalitsa hogs and the little ones are actually really cute! I believe that they are endangered. Our Large Blacks are. We had a cross that we brought to the butcher a couple of months ago but we asked for the hams, bacon and hocks so we could cure and smoke them ourselves. We didn't have time to work on sausage but have the lard and roast in the freezer so when we are ready...Michael likes to smoke meats. In fact he had to go to the hospital and was medicated by the EMTs along route. When we got there the nurse asked if Michael drank "No', 'Do you smoke?' "Michael's reply "I smoke hams and I smoke sausages..." It cracked us up It was our pigs in the sprinkler, they just love the water! I'm glad you got the haying done. In our area it looks like the farmers will get a third cutting. Awesome deal on the fridge!!! You go girl! I know that it's not exactly what you were looking for but what a blessing! I have learned to be content with everything, a growing process :) A penny saved IS a penny earned. Wonderful deal on the mushrooms, I love Portobellas and the baby ones too. They dry well. You can always saute in butter and freeze when cooled if you find another deal like that. I can't believe the killer deal on the peppers! That is awesome! The best price I have seen here is .88 each. I hear you on the coffee! We don't eat out very often, I usually drink water unless I am craving something like a good brewed Root Beer or a Chai Latte. Wow, those are some great deals!!! I LOVE Persimmons and what a great deal on the trees. Fall is the perfect time to purchase trees, shrubs and perennials at good discounts. I apologize for not posting more frequently, I have had some bad days and when I have better days it is spent trying to catch up and can. ~Being more organized. This has been a huge help in general but with canning supplies too. I haven't bought any supplies thinking that I needed them only to find out that I don't. ~One of our grocery stores had Raspberries .88 per 6 ounce container, these normally run for $3.99 or more each. My mom actually purchased 24 packages saving herself tons of money. ~We haven't had many red tomatoes so I have been utilizing the green ones. I made Green Tomato Salsa and right now I have Green Tomato Mincemeat simmering on the stove. ~We were blessed with an abundance of cucumbers so I was able to make a couple dozen pints of Bread and Butter Pickles, I made some adding crushed red pepper and garlic cloves for my honey. ~I was also able to make some Relish. ~One of the local Beekeepers has an Annual Honey Pour. Everyone brings their own container and they fill from the vat of honey. The price this year was $3.00 a pound so $9.00 a quart. We bought 2. The honey is so good! ~Found some more clothes and things at the thrift store: An LL Bean sweater for $1.00, a couple of really nice button down flannels (good quality) for my honey for .50 cents each. Some copper stripping for 75 cents (I want to try making cookie cutters and this is perfect), a couple of Quilting magazines for 25 cents each, I am learning to quilt and want to check out patterns and tips. I noticed a large amount of trash beside a dumpster in the alley. When I checked it out, I realised that someone had been evicted and all their stuff was thrown into bags and set out. I found a lovely Abercrombie and Fitch plaid shirt and a beautiful Perry Ellis sweater that fit me. I also found some sealed spice containers and a packaged corn muffin mix which hadn't been damaged. I also snagged some towels which I want to use to make a bathrobe. I blanched and froze some brussels sprouts and green and yellow beans I bought at a farmer's market. I have an acorn squash which grew in the compost that I will cut into eights, cut into chunks and freeze for soup. This will be such a help this winter. Where did Sept. go to where?? Family & farm life has kept us busy & happy so all is well here! Enjoy reading these post & learning so much! Thanks for sharing! Sharon, you gave our house a good laugh with your hubby's smoking story! Tooo funny! We would love to see your Big Blacks! Quick pig question: What do you do with the extra fat? Do you butcher your own? We've raised heritage before & that's the only thing we don't like is a lot more fat. I know it's comes with the breeds! Do you guys call your heritage breeds "fat pigs"? That's what they're called here with the factory pink pigs "lean". But the flavour of the heritage meat is OUTSTANDING!! What type of seasoning to you use for your sausages? We've tried just about anything but one that hit the spot was maple syrup, apples & sage. OH, where did you order your maple syrup from please? About 2 hours away from us a group of seniors have started to tap into older maples in the valley for fun. The syrup is to die for but it's usually sold out. I just heard of a recipe for butter tarts using maple syrup....sounds yummy! ..canning, canning & more canning! ..I like to look through the frozen section in the grocery store not to buy but to get ideas for quick meals for THOSE nights. I noticed pizza buns so rounded up the needed items with most on sale to make some. I put lots of garden veggies & browned hamburger on mine. Everything was pre cooked so after freezing they'll make a fast supper with a salad. Mine costed 47 cents with healthier toppings. ..harvested pumpkins, squash, onions & tomatoes....VERY GREEN tomatoes this year! Too cold of a season this year! ..swapped baking for local honey....it's soooo good! ..wanted a different patio table set & found one at a auction for $10. It used to be in a local 50's cafe so with some elbow grease it should turn out great. ..still buying grocery store gift cert. for winter supplies. 2 more than the big city trip!